This shows a 2.25" Button Maker kit that features a compact button machine that makes 2.25" buttons. The kit also includes a 2.25" graphic punch to cut your printed graphic, design software, button templates, and instructional CD and stock images. 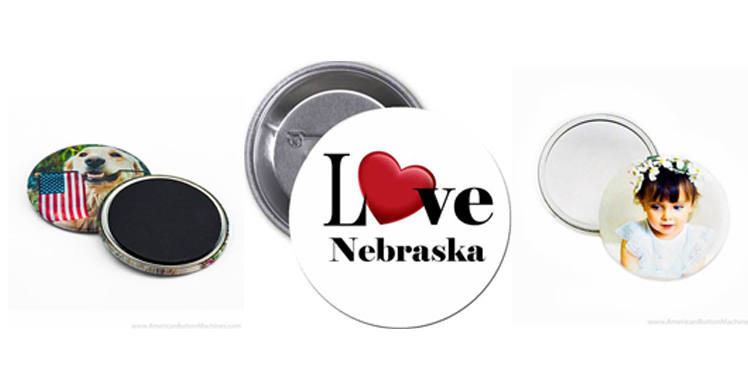 Supplies will be available for sale at the library to include pin back buttons, magnet back buttons, and mirror back buttons. After you design your button, you may print that design off at home or by using one of the library's printers (print charges may apply). If you wish to make a photo button, you may bring in a printed photo or you may print your photo on bright white paper available at your library. Bright white paper may be preferred over photos printed on photo paper because the bright white paper has a photo look and can wrap around the edges of the button. Photos printed on photo paper need to be cut slightly smaller because they are too stiff to wrap. But both will work. You will only need a small amount of counter or table space if you are making just one of two buttons. You will need more space for your supplies if you are making lots of buttons.